The trailer for William Friedkin‘s Killer Joe has gone online. The NC-17-rated film centers on a son (Emile Hirsch) and his father (Thomas Haden Church) who hire a cop moonlighting as a hitman (Matthew McConaughey) to murder their mother in order to get her insurance policy. 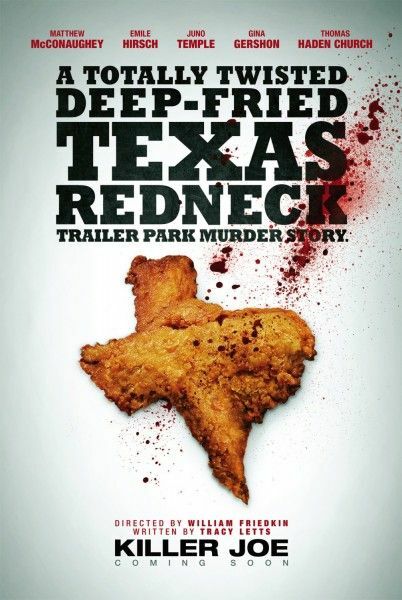 I caught Killer Joe last year at TIFF, and with the exception of McConaughey’s performance, the flick is pretty terrible. However, the absolutely bonkers ending almost makes the film worth your time. Hit the jump to check out the trailer. The film also stars Juno Temple and Gina Gershon. Killer Joe opens July 27th. When 22-year-old Chris (Emile Hirsch) finds himself in debt to a drug lord, he hires a hit man to dispatch his mother, whose $50,000 life insurance policy benefits his sister Dottie (Juno Temple). Chris finds Joe Cooper (Matthew McConaughey), a creepy, crazy Dallas cop who moonlights as a contract killer. When Chris can’t pay Joe upfront, Joe sets his sight on Dottie as collateral for the job. The contract killer and his hostage develop an unusual bond. Like from a modern-day, twisted fairy tale, “Killer Joe” Cooper becomes the prince to Dottie’s Cinderella. Based on the play by Pulitzer and Tony Award winner Tracy Letts, “Killer Joe” is a garish, provocative black comedy from Academy Award-winning director William Friedkin (The Exorcist, The French Connection) and stars Emile Hirsch, Matthew McConaughey, Juno Temple, Thomas Hayden Church, and Gina Gershon.